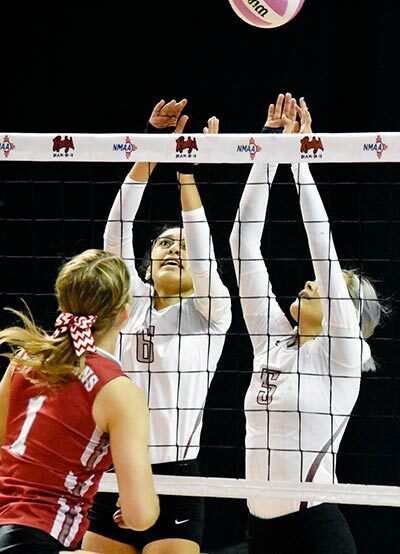 Navajo Times | Ravonelle Yazzie Ramah’s Taleah Herron (6) and Kourtney Lewis (5) attempt to block a hit on Saturday morning against the Logan Lady Longhorns during the 2017 New Mexico Class 2A state volleyball championship game in Rio Rancho. The Lady Longhorns defeated the Lady Mustangs, 3-2. Ramah’s Taleah Herron (6) and Kourtney Lewis (5) attempt to block a hit on Saturday morning against the Logan Lady Longhorns during the 2017 New Mexico Class 2A state volleyball championship game in Rio Rancho. The Lady Longhorns defeated the Lady Mustangs, 3-2. By the time the Ramah Lady Mustangs showed up at the state volleyball championships they were experts at putting up a fight. They were many times during the regular season where they had to bounce back in matches and push teams to five sets. The 2A state championship match was no different. Though Ramah came up short to Logan 3-2 in sets 20-25, 25-19, 25-19, 24-26, 15-9 and finished as 2A runner-ups, they didn’t go out without a fight. Ramah head coach Alejandro Rivera said it wasn’t a new look for his team. Logan started the match strong, and took a 14-8 lead before Ramah went on a 11-0 run to take the lead 19-14. Logan chipped at Ramah’s lead but came up short, giving Ramah the first set win, to lead 1-0. Ramah stayed with Logan most of the second set but Logan’s hitters put the ball away on every possession toward the end of the set. Logan took the set to 25-19 to even the score 1-1. Ramah battled again in the third set but started to give way to their mistakes toward the end of the set and came up short. Logan took Set Three, 25-19. Down 2-1, Ramah was pushed into a corner in the fourth set. They matched every point Logan put up and trailed them by at least one point. The Lady Mustangs found an opportunity to lead late in the set when they took over on a Logan mistake, 24-12. Ramah’s pushback caused Logan to create mistakes, including a play with four hits and a hit into the net, which gave Ramah the fourth-set win 26-14. Logan head coach Robert Young said they expected Ramah to push back.